Can Roy Goode and the ladies of La Belle survive Frank Griffin’s wrath? Has the Godless TV show been cancelled or renewed for a second season on Netflix? The television vulture is watching all the latest TV cancellation and renewal news, so this page is the place to track the status of Godless, season two. Bookmark it, or subscribe for the latest updates. Remember, the television vulture is watching your shows. Are you? Streaming on the Netflix paid subscription platform, Godless stars Jeff Daniels, Jack O’Connell, Michelle Dockery, Scoot McNairy, Thomas Brodie-Sangster, Merritt Wever, Jeremy Bobb, Whitney Able, and Samantha Soule. The 19th century western, from creators Scott Frank and Steven Soderbergh, centers on Roy Goode (O’Connell). After betraying his mentor, the infamous gangster Frank Griffin (Daniels), Roy must go on the run from him and his “brotherhood” of criminals. He seeks refuge at the ranch of the widow Alice Fletcher (Dockery), in La Belle, New Mexico, where women run the show. When the citizens learn Griffin and his gang are on their way, they unite to defend themselves against these notorious outlaws. Godless ended on November 22, 2017 so there won’t be a second season. Could it be revived in some way? Stay tuned for further updates. This was a close-ended series so there won’t be a second seaosn. However, I’ll keep an eye on the trades and update this page with breaking developments. Subscribe for free Godless cancellation or renewal alerts. Find more Godless TV series news or other Netflix TV show news. What do you think? 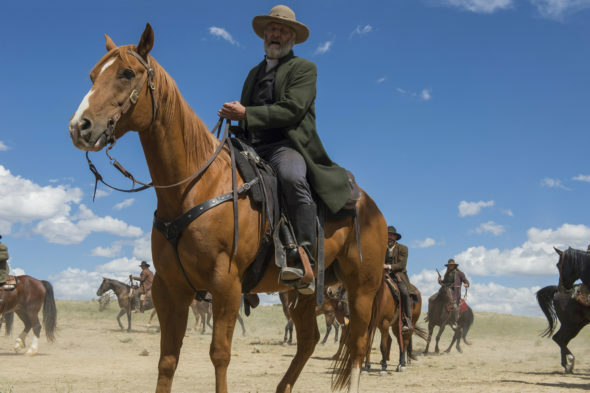 Do you hope the Godless TV show should have been renewed for a second season? Are you glad that the series ended after one season? More about: Godless, Godless: canceled or renewed?, Godless: ratings, Netflix TV shows: canceled or renewed? Tidelands: Is the Netflix TV Series Cancelled or Renewed for Season Two? Longmire: Is the Netflix TV Show Cancelled or Renewed for Season Seven? PLEASE renew Godless AND Strange Empire. Many of us are dying for good Westerns with strong chararacters and good themes. I’m counting on you to write Season 2 for both mini series. We want to see how the women rebuild their communities and respond and/or prepare for life’s challenges in the Old West. PLEASE renew Godless and Strange Empire. There are a lot of us who live Westerns and excellent drama with strong characters. Counting on you. Looking forward to Season 2 for BOTH mini series. I want to see both female communities rebuild. This series is so good! I’m not sure how popular it is on netflix but I know if enough people saw it they would definitely watch a second season. I would for sure. Godless needs to continue for a second season!! Loved it!! Actors fantastic and realistic scenes. Darn good western! Not Godless, but certainly lawless.